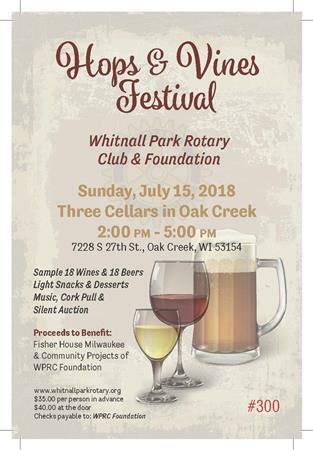 Join the Whitnall Park Rotary Club (WPRC) Foundation for an afternoon of beer & wine tasting at Three Cellars in Oak Creek, WI, on Sunday afternoon, July 15, 2:00-5:00 p.m. Sample 18 different beers and 18 different wines. Register, and pay securely, online by clicking here. The entire facility has been reserved for this event, which includes not just tasting but also light snacks, a silent auction, a cork pull, a 50-50 drawing, DJ music in the Rafters Room, and Greg Rogalinski singing the songs of Ol' Blue Eyes in the Sinatra Room (3:00-4:00 p.m.). Register, and pay securely, online by clicking here. Proceeds will benefit the Fisher House Wisconsin and other community projects of the WPRC Foundation. Purchase tickets ($35 beforehand & $40 at the door) from any WPRC member in person or pay securely online by clicking here. The retail store will also be open for the event, and 10% of any purchases will be included in the proceeds. Don't miss this fun-filled afternoon!